A chain of large and small lakes, potholes and wetlands in a forested setting in the upper Emar Creek watershed, offering small, user-maintained, wilderness campsites, and a circular canoe route with short portages. Visitors must be self-sufficient and prepared for user-maintained camping. Parking and camping is at Janice Lake and Willowgrouse Lake. Drive North on Hwy 5 to Little Fort. Turn left onto Hwy 24 and head west approximately 22 km. Entrance to the park is unmarked as of yet and is approximately 500 metres west of the summit sign, on the left. History: The park was created April 30, 1996 as a result of recommendations made in the Kamloops Land and Resource Management Plan. The park will be managed according to the Management Direction Statement for Emar Lakes Park. Cultural Heritage: The Hudson’s Bay Company Brigade Trail has been identified near Jim and Richard Lakes (the trail may be given a Heritage Trail designation). There is evidence for possible traditional native use in the area. Conservation: The park encompasses a small chain of lakes and surrounding forested plateau in the upper Emar Creek drainage. Protection to lodgepole pine, mixed spruce/pine stands and aspen groves is ensured along with important habitat for wildlife. Wildlife: Habitat for moose, Black Tern, Common Loon, Ruffed Grouse, and Great Horned Owl. A circular canoe route with short, user maintained portages, is cleared at the beginning of each summer. Portage through Janice Lake, Dytiscid Lake, Emar Lake, Willowgrouse Lake, Boulder Lake, Club Lake and Next Lake. Parking and camping is available at Janice Lake and Willowgrouse Lake. Fishing opportunities for rainbow trout exist in all lakes in the chain. Anyone fishing or angling in British Columbia must have an appropriate licence. 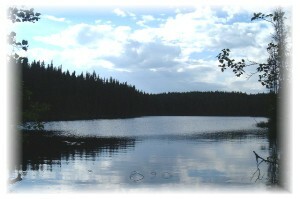 There are primitive trails between the lakes as part of the canoe route. There is no viewing platform but there are excellent opportunities for wildlife viewing. There are cross-country skiing and snowshoeing opportunities in this park but there are no maintained winter trails. Car top only launching area at Janice (Long Island) Lake. Fire rings are located at Janice Lake site only; no firewood is provided. Bring in your own firewood as cutting and/or foraging for wood is not permitted. Please keep fires small and ensure they are completely out before you leave. Use a camp stove for cooking. User-maintained parking and camping is available at Janice Lake and Willowgrouse Lake. There is a pit toilet and rustic picnic tables at each location. Note that the resort at the northwest end of the lake is privately owned. There are only a few, first-come, first-served sites at each location. Camping opportunities in this park are not suitable for large units.